A toll on a bridge across the River Thames is to double, the government has announced. 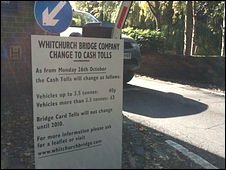 The private company, which runs Whitchurch Bridge between Berkshire and Oxfordshire, applied to increase the charge from 20p to 40p. Local residents in parishes on both sides of the bridge have objected to the rise. But the Whitchurch Bridge Company said the money would be needed to pay for a replacement crossing, costing £3.2m. A public inquiry into the proposed toll increase was held in June and a planning inspector recommended approval. The Grade II-listed structure was built in 1902 and is the third crossing at the site. Geoff Weir, of the bridge firm said the increase was needed because of a rise in construction costs for a replacement bridge, planned for 2013. "We don't take any pleasure in increasing the tolls, but it's a fact we need to get the money in to pay for the reconstruction of the bridge," he said. But Colin Cooper, from the campaign group Toll Freeze, said the increase was not justified. "It doubled only three years ago so it has quadrupled in a very short space of time," he said. "It's going up far faster than the rate of inflation." Henley MP John Howell, who campaigned against the changes, said he would be investigating whether the bridge could be run by the council. "It may be possible to seek a change in the law and there will undoubtedly be more calls for the bridge to be part of the county council network," he said. Reading West MP Martin Salter also condemned the decision, saying the charge was "too much to pay". The new cash toll charge will come into force on the 26th October.